A remote access VPN solution is only as good as the sum of its components' (client and server) features. This, however, does not only include a simple evaluation of technical aspects. The system has to meet the requirements of everybody involved in the decision process. End devices that are easy and intelligible to operate are every user's dream. Administrators, however, demand the same level of transparency and manageability in the wide area network (WAN) as they are used to from the local area network (LAN). 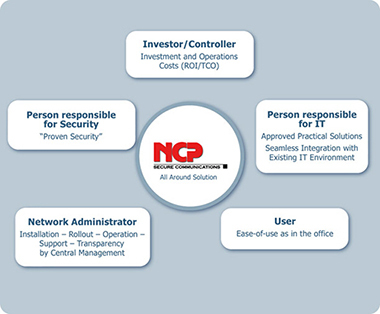 In order to meet the wishes of all users, NCP's remote access VPN solution offers comprehensive automatisms as well as configuration, display and surveillance options. Independent of the operating system, all NCP VPN Clients graphically display all connections and security statistics. Comprehensive cursor-sensitive tool tips offer quick information in clear text. Designed as one click solution, the software automatically carries out connection setup to the company network, while the user is able to monitor all phases. If an error occurs, it is displayed in red. It simplifies troubleshooting and support.The summary language selection facilitates international application. NCP's Secure Client integrates and supports 3/4G cards of various suppliers, i.e. displays them in the Client Monitor. This integration and support is the key to the display of field strength, provider and selected radio network. The installation of delivered management software of maps distributors and the associated call for an additional user interface can be cancelled. Each NCP Secure Client has its own configuration file in which it saves all connection parameter. The administrator can specify each parameter field and may store these as necessary against additional changes by the user. That creates configuration freedom for the realization of individual remote-access requirements. LTE currently allows the highest wireless communication rates. Since the virtual COM ports used before Windows 7 had become a bottle neck with LTE data communication, using Windows Mobile Broadband Interface now ensures maximal data communication speed. A further advantage of Mobile Broadband Support is the integrated dialer of NCP's VPN Client which automatically supports all current and future 3G/4G cards of Windows 7. The APN (Access Point Name) defines the access point of a mobile data connection at a provider. If the user changes provider, the system automatically takes APN data from the corresponding SIM card and uses it in client configuration. Through that, it is easy to use inexpensive, local providers abroad. The NCP VPN Client checks each connection establishment that selects available transmission media and automatically chooses one from the given sequence. The manual network selection is naturally given further on. If a teleworker moves within the reception area of several access points using the same SSID, the system automatically chooses the strongest access point available. Applications which communicate via a tunnel do not even "notice" this access point roaming. NCP's Secure Client is able to roam access points within a company network (e.g. while changing locations with a laptop) without having to set up a new data connection and logon to the gateway, again and again. This allows for continuous remote access despite changing IP addresses. You can call "seamless roaming" the logical advancement from "WiFi roaming". With "Seamless Roaming" the devices are able to automatically change between various networks, for example between LAN, WiFi and 3/4G. This further facilitates mobile computing and enables the state "always on" - meaning continuous and constant availability of applications of the mobile telework station. The client is able to automatically change the communication medium during a session and to dynamically redirect the VPN tunnel, while the user does not even notice this process. This feature allows for remote access behind firewalls whose settings prevent IPsec based data traffic (Port 500 or UDP encapsulation not possible). With the help of the VPN Path Finder technology, the NCP Secure Client can use Port 443 of the firewall (Fallback IPsec / HTTPS). This allows for a holistic IPsec-based implementation of the security policy (prerequisite: NCP VPN gateway, starting with v 8.0, at the corporate headquarters). In contrast to IKEv1, IKEv2 is faster during connection set up because it needs fewer prompts than its predecessor. Apart from that IKEv2 supports various protocols (e.g. NAT-T, DPD) which were required but not supported by version 1. Instead of XAUTH, EAP is used as the basis for authentication. The Mobility and Multihoming Protocol (MOBIKE) ensures higher reliability of IPsec tunnels in mobile applications. NCPs VPN Client Suite is designed to be easy to configure and allows performant connection setup. The specifications of IKEv2 make setup of virtual private networks easier, more flexible and more reliable. Supporting IKEv2 makes the NCP VPN Client Suite compatible to almost every other available VPN gateway - amongst others the Microsoft Windows Server 2008 R2. You can also integrate NCP's Secure Enterprise Clients into a centrally managed, cross-company VPN. This includes tasks like client configuration, mass rollouts, software updates, certificate administration and checking security policies. NCP's Secure Enterprise Management (link) manages these tasks. The users can register comfortably without intricate changes between various user interfaces onto Windows domains – this also applies to UMTS and GPRS. A transmission medium is already selected during the booting phase. After automatic media selection and entry of a PIN (for SIM or certificate), a tunneled connection is created to the company network, where domain registration – likewise automated – can take place. All NCP Secure Clients have a dynamic personal firewall. A remote access VPN has to guarantee confidentiality, integrity and availability of information and systems. NCP's remote access VPN solution guarantees this security. It sustainably protects your end devices and communication mediums from attacks by using seamlessly interacting security mechanisms. Security levels are not static but constantly changing. To meet those changing but current threats in time, all security features have to be upgraded to cutting edge technology. NCP's software components are inexpensive due to low cost updates or upgrades. This personal firewall serves to protect terminal equipment against internet attacks, WiFi and LAN. It is a component of all NCP Secure Clients, therefore independent of the operating system and may be centrally administered (Enterprise Solution). PC protection takes place during system startup and automatically conforms to the prevailing remote access environment. "Friendly Net Detection" provides automatic recognition of secure and insecure networks. This means the system activates or deactivates the appropriate firewall policy without the help of the teleworker. The administrator centrally sets parameter locks, which provide further security. They prevent users from manipulating or accidentally deactivating the configuration. With this feature, even security sensitive locations like public hotspots can serve as access points to the company network. The personal firewall remains active as desired if the VPN service is deactivated. NCP's VPN solution always supports the markets latest, high performance algorithms and key lengths. Fast and inexpensive, you can download software updates from the Internet. In a VPN, it is no longer sufficient today to allow access to the company network through user-name and password. Both are easy for hackers to spy out. For this reason, NCP only uses strong authentication methods for its VPNsolutions. The methods are: OTP token (one time password), digital certificates within a PKI (public key infrastructure) and biometric technologies. The one-time passwords are generated dynamically, replacing the static passwords and immediately lose their validity after use. Digital certificates dispose over a still higher degree of protection and are universally applicable as well. You can apply it as software or on a Smart Card as an X.509 v3 certificate. When required, it can be collaborated with several trust centers/certification (CA's) (multi CA-support). The high-availability services of the Secure Enterprise Solution provides for the higher degree of availability of the Secure Enterprise VPN Server with their backup and load-balancing mechanisms. These services ensure that at any point in time – also in the event of a disturbance – all VPN tunnels are available to access the company network. Additional information may be found here. NCP's Secure Clients integrate cryptographic algorithms according to the international FIPS security standard. The embedded cryptographic module, containing the corresponding algorithms, is certified according to FIPS 140-2 (Certificate #1051). From a commercial point of view, a remote access VPN has to pay off as fast as possible. This means comparing investment costs and operating costs (total cost of ownership) and avoiding hidden costs. In this, savings of up to 85% are possible. For the high compatibility level of NCP's software, the investor can continue to use already existing IT infrastructure. Additionally he can expand his VPN according to his needs and according to the latest technological standards, because of the availability inexpensive updates and upgrades for all software components. Installation and operation, especially with complex VPN environments, drive up costs. Sometimes rollout costs alone, already exceed investment costs of a VPN solution. In certain industries, like in the insurance industry which is characterized by high staff turnover (25 - 30% p.a. ), operation costs are incredibly high. Minimizing these cost drivers is part of NCP's Secure Enterprise Management. As central intelligence of the system it offers all necessary features for fully automatic operation of a VPN. Support costs take up a high relative importance under "Total Cost of Ownership" (TCO). It is worthwhile to keep it as low as possible. For network administration this means a preference for certain client configurations from a central place. Parameter locks hinder subsequent manipulation, whether intentionally or through an accidental operation. Furthermore, the intuitive graphical user interface with error reports in clear text, permits quick fixes for malfunction events. The NCP VPN Management serves as a single point of administration for all the efficient operations of a VPN required performance features. For example, it shortens the time exposure for rollout, certificate administration and software distribution. Required changes, e.g. with changes in personnel/staff turnover, they are effectively resolved in real time. This relieves network administration and leads to massive cost savings. NCP's VPN solution is fully compatible to all common network technologies and operating systems. Through this, the software can be easily integrated into existing identity and access management systems (IAM). Time and money consuming upgrades of existing systems and expensive new investments into IT infrastructure become obsolete. A Budget-Manager for full cost control is now integrated in the new NCP VPN Client for Windows. The Budget-Manager serves to monitor the costs of all available connection types, focusing on UMTS, GPRS as well as WLAN connections. For this purpose, the administrators or users configure volume or time limits according to the basic provider rates. Should the user exceed his set limit, depending on the settings either a warning notice appears or further connection attempts are hindered. The Budget Manager also allows the restriction or disabling of roaming. Nasty surprises in the provider invoice are avoided in this manner. Integrated data compression aid further cost savings. This feature is very effective and leads to savings of up to 25% in tariffed transmission networks. The Short Hold Mode guarantees that no communication costs occur if no user data is sent or received during a session monitored by NCP's software. When the teleworker continues his session, he does not have to login to the central VPN gateway again. He can resume his work from where he stopped his activities. This even works under "difficult" conditions, if for example peripheral Citrix clients are used. All NCP VPN Clients are disposed according to standards over an integrated personal firewall. The expense for evaluation, licensing and installation of a supplemental personal firewall is removed. Administration and maintenance can take place optionally from a central place. ntegrative component of the NCP VPN Management is, next to an integrated control and monitoring mechanism, a RADIUS Server. Already available RADIUS systems can be pooled, and thereby be replaced in an economical manner. This feature allows for concurrent operation of several VPNs of various companies via a single NCP Secure Enterprise VPN Server. The provider sets up a closed VPN for each company (client) – only the employees of this company have access to this particular VPN. Several independent systems become obsolete through this VPN gateway sharing. Managed Security Service Provider (MSSP) utilize this economic advantage for setup and operation of managed VPNs. In this concept, employees work with their own end devices. BYOD concepts increase user satisfaction and with this productivity. In order to let the company fully profit from these benefits, NCP's remote access VPN solution supports a wide range of operating systems. With this all devices can be integrated into a comprehensive VPN. Currently, virtualization is the most important IT technology. It contains many measurable benefits for a data center - amongst others: increased efficiency and availability, cost savings and higher productivity. NCP's solution is 100% software-based. It offers all prerequisites for substantial cost savings during installation and operation - even of larger VPN environments. Download the Enterprise Brochure (PDF). Download the Benefits of NCP Secure Communications Solutions Brochure (PDF). Download the NCP Next Generation IPsec VPN Brochure (PDF).